Human Rights Watch says it has seen “no discernible improvement” in the human rights situation in North Korea since Kim Jong Un took power in late 2011. The verdict, which likely comes as no surprise to anyone that watches the country, was included in the New York-based group’s annual “World Report” on human rights in countries around the world. “The government continues to impose totalitarian rule,” the report said. Five pages are devoted to North Korea and sum up the government’s use of torture and executions, prison camps, restrictions on movement, refugees and labor rights. 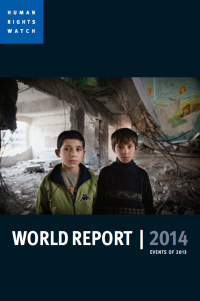 A PDF file of the report can be download from Human Rights Watch. The report did not cover South Korea, which places some restrictions on information its citizens can freely access on the Internet.